Did your teachers fully engage you in learning? 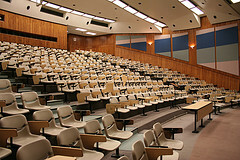 Did you sit in a brain numbing lecture, absorbing little, and waiting for the class to be over? The Globe and Mail wrote an article on Carl Wieman. Dr Wieman, an Nobel laureate, is on a mission to change the way science is taught. He wants to engage the learner. He claims that universities are doing a terrible job of teaching students and it is time to shift to student engagement in learning. He wants professors to stop lecturing and begin to engage students through questions and group discussions and teach them to think like scientists, rather than just recite facts. In today’s workplace are you engaging employees in their work? What Dr. Wieman is attempting to do for the science classroom, I encourage you to do for your workplace. Don’t just stand at the front of the room teaching or preaching, foster engagement with direct and meaningful interactions with the people you work with. And that’s the end of my lecture!